I have come to really love face oils in the past few years, so of course I jumped at the chance to try the coveted Beauty Elixirs from Kypris. Face oils are so great for regular moisturizing, but they can be especially wonderful when your face needs a serious emergency drink in a hurry. I generally wear face oils at night, either underneath my night cream or alone while I sleep, but occasionally I'll wear an oil on my face during the day underneath make-up or on its own with or without moisturizer on make-up free days spent working alone at home. Applying a face oil takes almost no time at all, but always feels like a special treat. It's the easiest thing in the world I can do for my skin from time to time and the ones that smell nice can instantly make a night of staying home with a film on Netflix feel a little more like a relaxing evening at the spa. 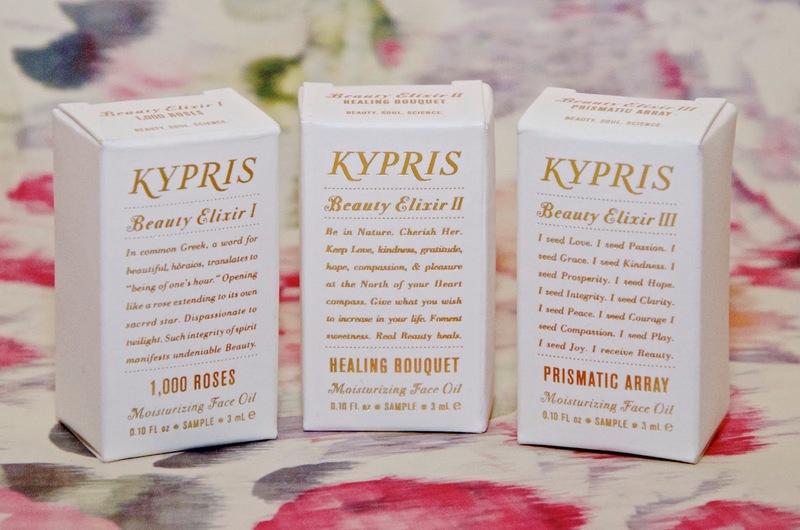 There are three Beauty Elixirs in the Kypris Range, 1,000 Roses, Healing Bouquet and Prismatic Array and each serves a different purpose. I have tried them all and they are all incredible. I think my favorite is Healing Bouquet, although I love all three for different reasons on different days. All of the oils can be used both day and night, either alone or layered with other skincare products, make-up or sun creams and each one is suitable for most skin types. The first of the Kypris Beauty Elixirs is for rose lovers. 100% active, this moisturizing beauty oil was created with botanical extracts and the essential oil of 1,000 Bulgarian roses. Harnessing holistic principles, this gorgeous oil aims to repair signs of environmental effects to the skin while leaving your face dewy, glowing and as soft as a rose petal. 1,000 Roses is suitable for most skin types, but it's most recommended for anyone who deals with skin issues due to hormones or pollution. If dryness is a skin issue you struggle with, this one is for you. If you love rose scents, you're in for a treat. The fragrance is subtle and in no way resembles typical rose scents that sometimes smell more like macaroons than flowers. This oil is just lovely and leaves my skin feeling silky smooth and soft as can be every time I use it. Also suitable for most skin types, Healing Bouquet aims to soften, tone, moisturize, protect & boost collagen, reduce signs of excessive UV exposure, enhance elasticity and boost luminosity while providing grounding aromatherapy for each chakra. Perfect for combination skin, Healing Bouquet is also good for anyone who has inflamed or irritated skin due to blemishes or environmental factors. If you have oily skin, this is the one for you as it helps to balance the moisture. Healing Bouquet is my favorite of the Kypris Beauty Elixirs. It smells amazing and feels great on my skin. Prismatic Array is the choice for anyone who can't or doesn't like to use essential oils on their face, but it's still brilliant. If skin sensitivity is something you struggle with, this one is for you. Made with phytonutrients, essential fatty acids and Vitamin C, this oil tones, softens, moisturizes, boosts luminosity and can soften, calm & nourish chapped skin, making it a must-have for anyone whose skin suffers in cold weather. Prismatic Array is also good for most skin types and still smells lovely even though it contains no essential oils. 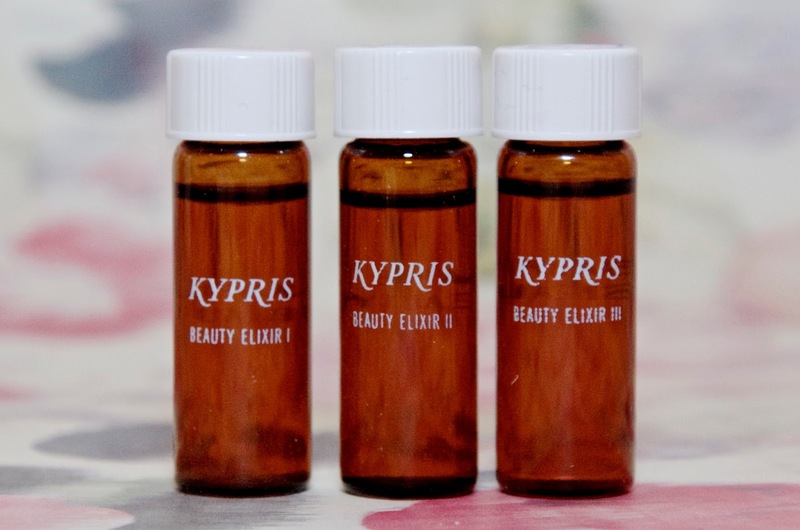 All of the Kypris Beauty Elixirs are available in full size and mini size. The full size elixirs range in price from $150 to $225 and the minis range from $70 to $90. All of these gorgeous oils are available online via Kyprisbeauty.com and Selfridges. These little luxuries are not only beneficial to your skin, but to your senses as well, so treat yourself - you deserve it!